In October last year I had the joy of watching [Cargo] which is a film that takes place entirely in the one small location of a shipping container. At the same time I was pointed to the novelisation of the film by J.C Macek III, he was a producer of the movie, and also provided the voices of two characters in it. I had been provided with a free copy of the book, but due to not being able to get the download to work (Amazon hates people being in different regions it appears!) I ended up buying it myself. I guess this review will go a little differently in that a lot of what I will talk about is the contrast between the book and the film rather than to the quality of what is written. So corrupt businessman Anthony Peterson wakes one day to find himself locked inside a shipping container. The only item with him is a mobile phone which soon rings. He is informed that both him and his wife have been kidnapped, and that if Anthony doesn't raise ten million dollars ransom money within 24 hours then both him and his wife will be killed. With only a phone at his disposal Anthony goes on a desperate mission to try and get the needed money. Along the way he begins to question just what sort of a person he actually is. Being able to set an entire film in the one dark location, with just the one character was a hard task I felt. Yet somehow it worked, helped in no small part by the exciting camera work that replicated the action Anthony is hearing over the phone. Here without the constraint of being visual it works out better than even that. A lot of the issues I had before was that I didn't understand Peterson's shift in attitude over the course of the movie, the unexpected resolution felt weird. Here though you read much more about what is going through the characters mind. Being able to read his thoughts, and his realisations it makes a lot more of a natural type of sense. It is also in the novel that scenes occur outside of the cargo container. Peterson's assistant Tom was a highlight of the movie, and he is also a highlight of the book. There is nothing really new with him, himself, instead we get to see things from his perspective rather than his actions just playing out down the phone. There is also a really nice new angle of the police force's response to his city wide crazy antics, them discussing amongst themselves the chaos he is inadvertently causing as he tries to get the ten million together was pretty amusing. He is the main comedic angle of the whole story so it was nice to see some additions, such as a resolution to his sub plot. Talking of extra material there was also a great new character introduced, a mercenary that the kidnapper has hired gets a few chapters. This is used as a contrast to a hired gun paid to kill, and Peterson who pays people to kill, and also a way to get Peterson's wife more into this. I really liked his story, he added a nice breather to the main plot going on. Each chapter is headed with a timestamp chronicling the passing of time. This gave new light to what was going on as in the film it felt like it was taking place over one night, while it is apparent here that it is more over the course of a whole 24 hour period, with some of Tom's antics actually taking place in broad daylight. It is all written in a simple style that was easy to read, a lot of the dialogue is the same as what was said, and so I found it easy to hear the characters voices saying the lines that I read. Even though I knew how this would end I found it just as fun to imagine again, for a book about a guy trapped in a shipping container this sure is packed to the gills with excitement and thrills. 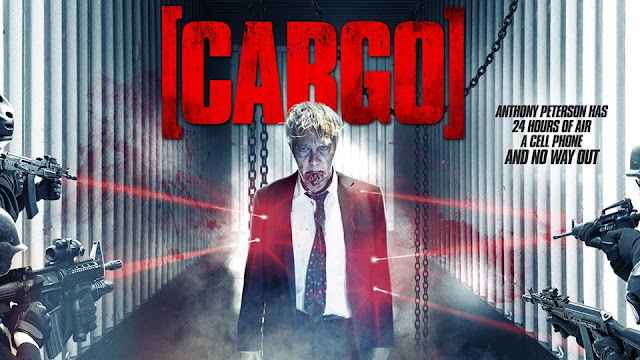 I felt that [Cargo] the movie was an experiment that actually succeeded with how it played out. [Cargo] the book was something I enjoyed even more. With a bleak premise this is actually something that has a jet of black humour running throughout. I found myself glued to the e-book reader whenever I sat down to read this.